It’s now February 22nd, 2014, in Rubicon 1.2.2. As you’ll find, skills play a major role in what ships you fly, how well you fly them, and what role you fly them as. 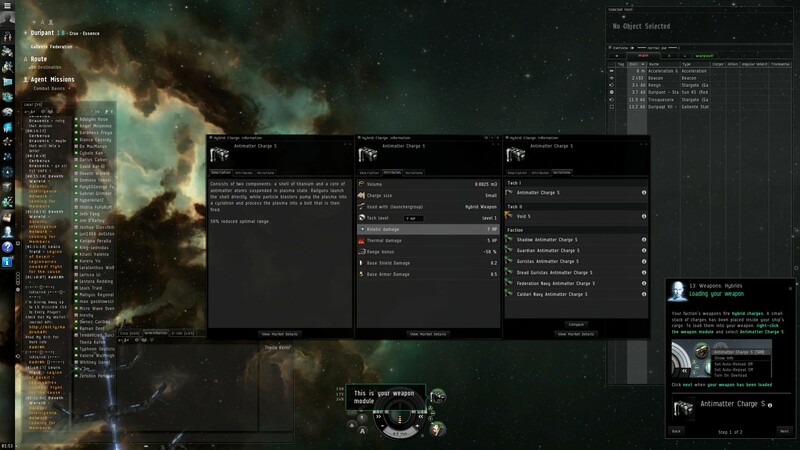 Skill training is also unique in Eve Online in that your skills train in real time – even when you’re not logged into the game. Wow! That means that it’s possible to maximize your character’s development by ensuring there is always a skill training. On the flipside, allowing your character to idle without anything training represents lost opportunities for advancement. 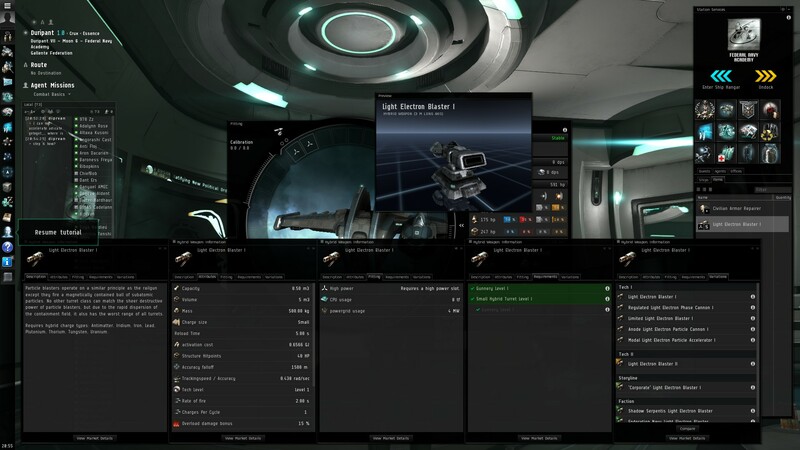 The Description tab explains that the Repair Systems skill imparts knowledge related to the use of armor and hull repair modules. More specifically, each level I train the skill will provide a 5% time reduction in how long it takes for the modules to repair. The Attributes tab includes more details on the skill including the primary and secondary attributes affecting it. Every skill in the game has two attributes which impact the time it takes to train. In this case, the higher my character’s Intelligence and Memory attributes are, the faster the Repair Systems skill will train. Again we see the -5% repair duration bonus gained by each level of the skill. Lastly, we can note a training time multiplier of 1x, meaning this skill is going to train pretty quickly relative to a 2x or 3x skill. You can think of that as something along the lines of a difficulty level for learning the skill. The Requirements tab shows a list of all the other skills, and their levels, that must be completed before my character can inject or train this skill. It looks like the only requirement is Mechanics Level 1, which my character had started with when she was created. In other cases I may see a skill that is partially trained, but not to the required level, in amber; or a required skill that I haven’t learned at all, in red. The Required For tab is a really nice way to see what the skill unlocks, at each level. It looks like training Repair Systems to level 1 will grant me access to a wide variety of Hull and Armor Repair modules, listed under the “Ship Equipment” group. If I then click on the “V” tab I can see that training Repair Systems all the way to level 5 will allow me to then move onto training Capital Repair Systems. If you haven’t already, go ahead and start that skill training. You’ll note that the skill disappears from your Item Hangar – it gets “used up” when you inject it into your brain. You might also notice that a little bar begins filling up just below your character portrait in the Neocom, allowing you to track your training practice. If you hover your mouse over this bar you’ll see what skill and level is being trained and how long you have until it is complete. We’ll find out more about where it goes and how to manage your skills later on. For now, let’s click “Next” and continue to the next tutorial. Finally, we get to shoot some pirates! As you accept the mission notice that the reward you’ll be receiving includes a Small Armor Repairer I. It’s a good thing we’re training Repair Systems! Click “Next” to continue. Quick note that, as mentioned before, I’m starting a new Gallente pilot. If you chose to create a Caldari, Amarr, or Minmatar pilot you will see a slightly different tutorial here that caters to the strengths of your racial ship traits. Go ahead and open the Fitting window, either from the Neocom, the Station Services bar, the station quarters, or your keyboard shortcut (Alt-F by default). You’ll be seeing a lot of this window as you progress through your career, as it allows you to fit weapons and other modules to your ships in order to improve their effectiveness or adjust their role. In our Item Hangar we’ve been provided with our first weapon – a Light Electron Blaster I – and a utility module named Civilian Armor Repairer. 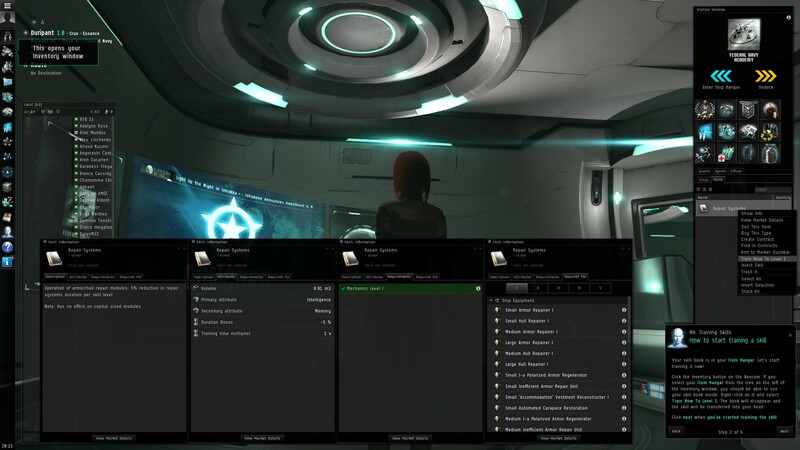 Throughout the tutorials you’ll receive multiple “Civilian” modules. Know that these are only useful during the tutorials (some literally only work when in the tutorial missions) and you’ll want to replace them with more effective modules before continuing on beyond the tutorials. In fact, if you “Show Info” on a Civilian module you’ll notice it has no “Requirements” tab, as they’re intended to be used by young players just learning to fly. The Description tab provides some lore on the turret, and it also lists out the types of charges (ammunition) the turret can be loaded with. The Capacity of 0.50 m3 indicates how much ammo it can hold at once. The actual number of shots before needing to reload will depend on the size of the ammo loaded and the turret’s capacity. The Charge Size indicates the size ammo the weapon can be loaded with. In this case the charge size is Small. Similarly, our Used With (Chargegroup) of Hybrid Charge indicates what type of ammunition is loaded into the turret. A Reload Time of 5.00 s means it will take five seconds to reload the turret’s ammo. The Activation Cost indicates that each time the turret fires, the ship’s capacitor is taxed 0.6566 GJ. It’s worth noting that not all weapons have an activation cost. The Trackingspeed / Accuracy indicates how fast the turret can turn to follow a moving target. This will become an extremely vital piece of information to know down the road, especially when moving into larger ships or participating in PVP, because if the target you are shooting at is moving too fast for the turret to track you simply will not be able to shoot it. Our trackingspeed of 0.438 rad/sec will be more than adequate for our near term needs. The other two essential statistics, Optimal Range and Accuracy Falloff, indicate how far the turret can effectively shoot. 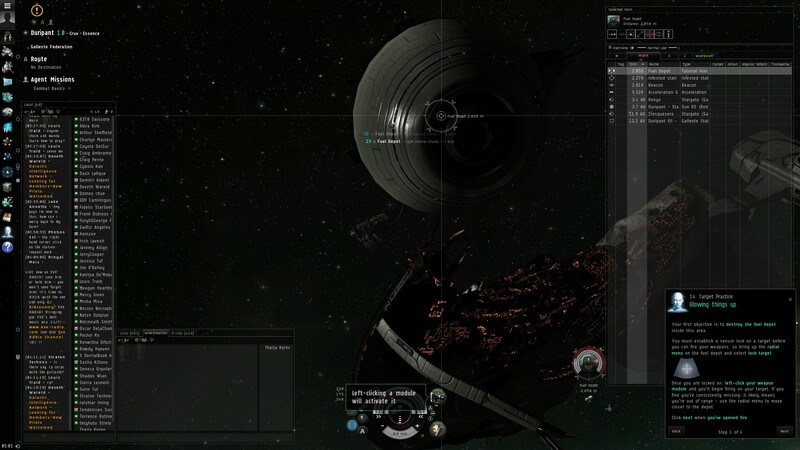 The way this works in Eve is that, in an ideal setting, your weapons do 100% damage at optimal range and past that they drop to 50% damage across the falloff distance. For instance, my new Light Electron Blaster I should do its full damage out to 1000 m, while at a distance of 2500 m (1000 m optimal + 1500 m falloff) it would be doing 50% damage. Outside of the falloff weapon damage drops down towards 0% fairly quickly, so it’s usually best to keep your targets within that optimal + falloff range. Our Rate of Fire and Charges Per Cycle indicate that the turret will shoot one charge every 2.00 seconds. Our Damage Modifier, 1.8375 x, indicates that the charges we’ve loaded will have their damage increased by nearly double – in an ideal environment. Next up, the Fitting tab displays the CPU and Powergrid requirements needed to equip the module, as well as the slot type. CPU, powergrid, and fitting slots are provided by the ship itself, and can be seen within the Fitting window. My Light Electron Blaster I requires a high slot, 8 tf available CPU, and 4 MW available powergrid in order to equip it to my ship. The Requirements tab works just like with the skill book we had looked at earlier. The Light Electron Blaster I requires Gunnery level 1 and Small Hybrid Turret level 1 – both of which my character started with. Finally, the Variations tab displays other flavors of the module, including more powerful “named” Tech 1 variations, Tech 2 variations, and rare Storyline and Faction versions. One other quick note on the info window for the turret is that, by clicking on the module’s icon at the top-left of the window, it is possible to view the 3D model of the weapon. As you become a more confident pilot, this can be a useful tool when attempting to recognize what weapon types an enemy ship is fit with. You’ll also notice that the icons for the modules in your Item Hangar include thumbnails indicating the slot type they fit to – high (with three lines), medium (with two lines), and low (with a single line). Go ahead and undock, then warp to the mission’s location as we did previously. Next! Again, the content of this tutorial may vary based on your character’s race. Ah, now we start to see what that big round complex-looking mess at the bottom of the screen is! Here we can see the two modules we’ve fitted onto our ship – and we can see that the blaster appears at the top, next to the high slot icon, while the armor repairer sits at the bottom, next to the low slot icon. It’s all starting to come together. In order for our weapons to be useful we need to load them with proper ammunition. Thankfully, the mission has just provided us with some in our ship’s cargo hold. 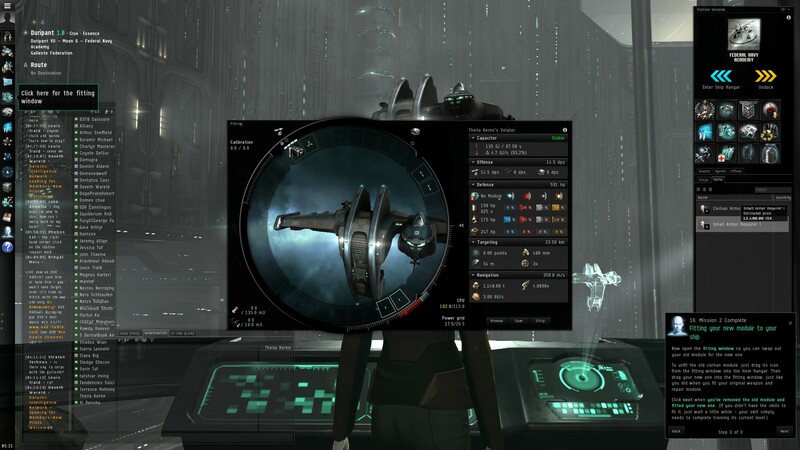 If we right-click our turret module at the bottom of the screen we are provided with several options, the top of which is to load it with the ammo we’ve just been given, which will load the ammo from the ship’s cargo into the weapon (so try not to forget ammo when you undock from a station). In my case that is Antimatter Charge S (“S” standing for “Small” – a small hybrid charge). Doing so displays a popup that the reload will take five seconds, just as I had seen in the turret’s info panel. As we’ve seen before, the Description tab provides some lore on the ammo as well as its defining characteristics. The Antimatter Charge S, for instance, imposes a 50% reduction on my turret’s optimal range. The Attributes tab provides more detailed information, allowing us to confirm the charge size (Small), launcher group (Hybrid Weapon), and the volume per charge, which indeed is 0.0025 m3. We can also see the damage value, which in this case is 7 HP Kinetic and 5 HP Thermal. We can also find base damage values for shield and armor, which are calculated based on a number of assumptions and can usually be safely ignored. We’ll talk more about damage below. Lastly, the Variations tab provides details on all the other versions of this ammunition, similar to what we saw when looking at the turret’s variations. Putting this all together, once my Light Electron Blaster I has been loaded with Antimatter Charge S we receive a reduction in optimal range, from 1000 m to 500 m, meaning that I now want to keep my targets within about 2000 m (500 m optimal + 1500 m falloff), for an up close and personal fight. Furthermore, we can calculate our damage by taking the raw damage from the ammo, 7 HP Kinetic and 5 HP Thermal, and multiplying that by the turret’s damage modifier, 1.8375 x, to calculate our actual ideal damage to be 12.8625 HP Kinetic and 9.1857 HP Thermal. But wait! If you hover your mouse over the module at the bottom of the screen you will see the turret’s optimal and falloff distances as well as its damage output. However, the numbers displayed are higher than expected. This is because your ship is providing a bonus. If you “Show Info” for the ship itself, which can be done by right-clicking in the middle of that wacky circle displayed at the bottom of the screen, you’ll see the ship is providing a 10% bonus to the turret’s damage output. In this case this is represented as a “10% bonus to Small Hybrid Turret damage.” Additionally, skills will impact the turret’s damage, such as my character’s Small Hybrid Turret skill adding an additional 15% damage. If you view the attributes for the turret equipped to the ship you’ll spot that the damage multiplier listed here reflects these increases, and is now sitting at 2.3244375 x. That’s 1.8375 * 1.1 * 1.15 for anyone trying to keep track. Because this is all displayed for you when you hover over the turret module you really don’t need to know all of this information, however it’s a great example of how ships, modules, skills, and many other components of the game come together to impact one another. 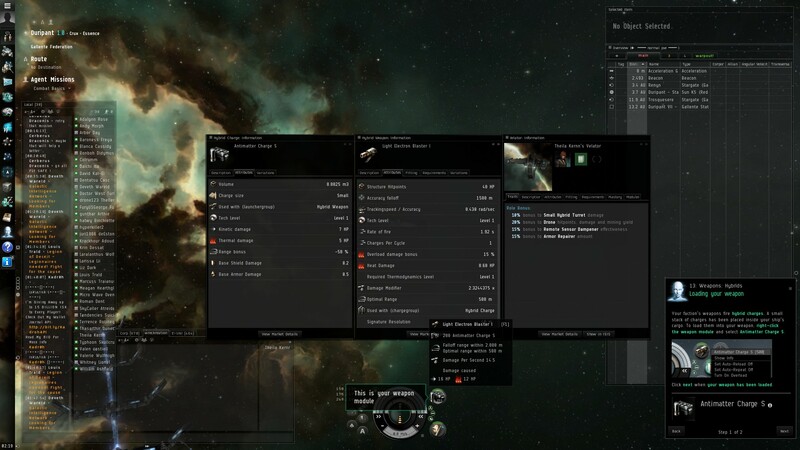 Eve provides four unique damage types: Electromagnetic, Thermal, Kinetic, and Explosive. Different ammunition types will deal different types of damage, and each damage type will have specific strengths and weaknesses when it comes to shields are armor. There is a great article on how turrets work, with far more detail than what is included here, over at Eve University. Before we can shoot at something we need to lock onto the target. 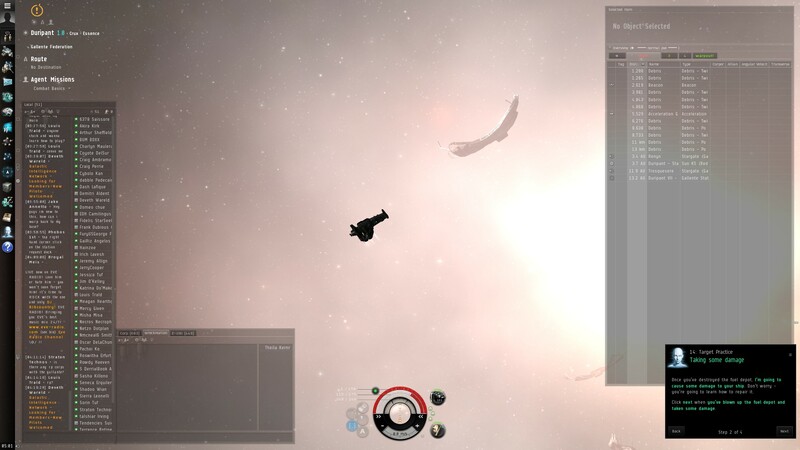 This can be done through the radial menu, or by control-clicking on the target either in space or in the overview. 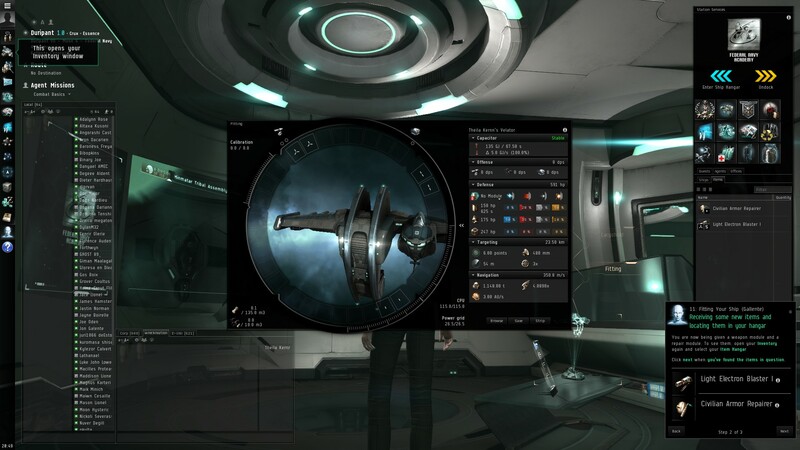 After a brief second or so your target should be locked and will appear in the target list as a circle surrounded by three bands of white bars – similar to your own ship’s representation at the bottom of the screen. If you like, you can reposition the target list by dragging the small circle that appears to its lower-right. Below the target is displayed its name and current distance. The Fuel Depot I’ve just locked onto is 2050 m away, just barely outside of my blaster’s falloff range, but close enough that I’ll still be doing decent damage. In order to open fire I simply need to make sure my target is selected (selected targets display spinning arrows around them) and to click the modules I wish to attack with. Clicking the Light Electron Blaster I will open fire – shooting a single charge roughly every two seconds. As you shoot at the target you’ll notice the white bars surrounding the target will begin dropping, replaced by red. These represent the target’s shields, armor, and structure – from the outer ring to the inner ring. 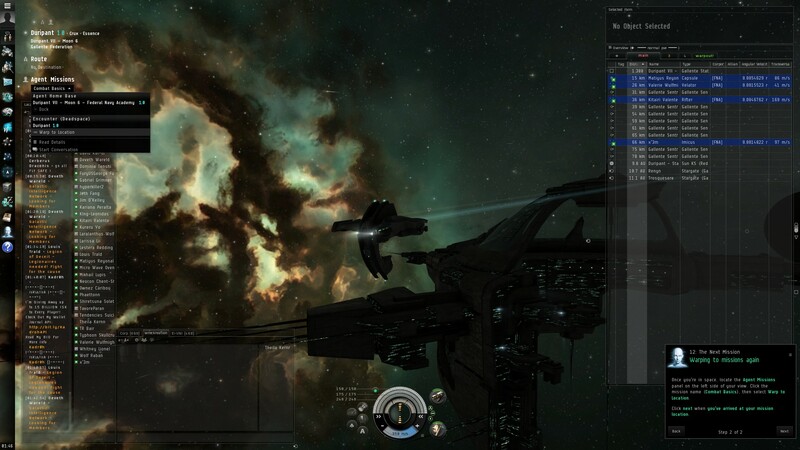 You’ll probably notice the turret glows green while active, and a white bar fills around the edge of the module indicating time until the next attack volley. After a few rounds from the turret the Fuel Depot is destroyed… but the resulting explosions have inflicted some collateral damage to my ship, represented by my own white/red rings at the bottom of the screen. The top half is surrounded by white rings that give way to red, representing the ship’s health. The top ring represents the ship’s shields, which take damage first. The middle ring is the ship’s armor, which takes damage after the shields. And the inner ring, taking damage last, is the ship’s structure. When the structure is gone the ship is lost. You can also display the ship’s shield, armor, and hull values to the left of the rings, either as percentages or explicit values. The bottom of the circle represents the ship’s speed. By clicking anywhere in this region you can adjust the ship’s speed. 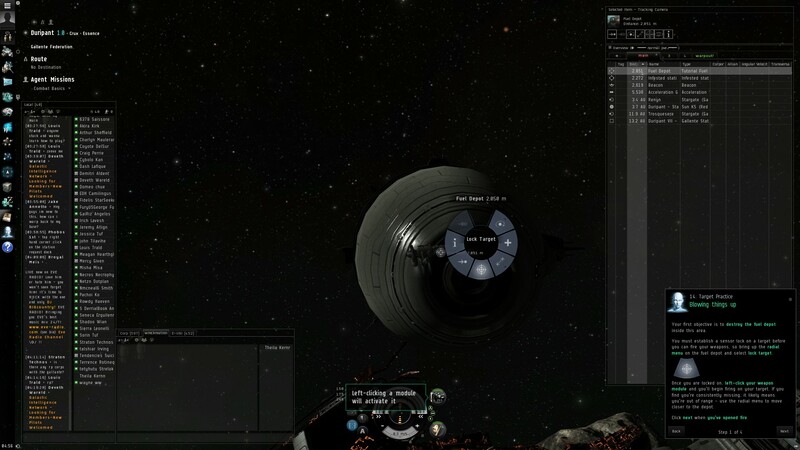 In the center of the circle your ship’s capacitor is displayed. The capacitor provides energy to the ship’s systems and active modules, which can include turrets, repair modules, scanners, propulsion, and more. To the right, as we’ve seen, are the ship’s modules. These can be clicked on to activate or deactivate each module. The layout for the modules can be adjusted simply by dragging them to new positions, and identical weapon modules can be stacked by dragging them onto one another to allow for multiple weapons to attack with a single click. To the left you will find buttons for various tools including the ship’s cargo, tactical display, scanner, autopilot, and camera options. We’ll see more about these later, but feel free to poke around here if you like. Note that you can access options related to the HUD from the horizontal bars button to its lower-right. You can also adjust the position of the HUD by shift-clicking and dragging it left or right. I like to scoot it slightly to the left, so it sits next to my chat windows. By now you may have noticed that your shields have fully recharged. Shields are the only damage that will automatically recharge over time. They will also immediately recharge when you dock at a station. Armor and structure damage, on the other hand, must be manually repaired – either by activating a repair module or by paying for a repair while docked at a station. Luckily, we’ve equipped a Civilian Armor Repairer and can activate it to quickly heal the remaining armor damage our ship has sustained. That Fuel Depot didn’t stand a chance, and it’s about time we try taking on some prey that has the capability to fight back. Hit the Acceleration Gate and get ready to take on some pirates. Dropping out of warp you should spot an NPC pirate, represented by a red cross. Lock onto the target and get ready for a fight. Since this target is moving we’ll want to get within range before we can shoot it. Chances are the pirates will approach you fairly quickly, but if necessary you can choose to “Approach” the pirate using the radial menu. After destroying the two pirates it would be a good time to click over to that “Looting” Overview tab we had set up earlier, to check and see if anything might be waiting for you in the wrecks. Lootable wrecks are indicated by solid triangle icons. Chances are there’s nothing to loot here, so click “Next” and we’re ready to turn in the mission. Return to the station and dock up, then open a conversation with the agent and complete the mission. This will yield the reward of a proper Small Armor Repairer I which can replace the Civilian version we had on the ship. Open up the Fitting window, unfit the old module, and drag the new one into the window to fit it. Click “Next” and we’ve completed another mission, another tutorial, and have some actual combat experience under our belts. We’ll be returning soon with part 3 of the Tutorial Tutorial to wrap up the general new player tutorial. Fly safe!